Ninja Turtles love it. Travelers book flights to Italy for it. College students survive on it. Soccer moms pick it up on the way home from practice. The savory wonder that packs all five food groups into one chewy cheesy bite. We invaded pizza joints from Destin to Rosemary Beach and tried them all to bring you our latest SoWal List. Whether you prefer brick oven, New York style, or gluten and dairy free, there’s a pizza for you out there somewhere just waiting to be loved. Rosemary Beach’s favorite family-friendly pizza spot serves up New York Style pies made with the freshest ingredients. The sauce is made from scratch daily using only fresh herbs and unique ingredients, like black garlic and hand plucked thyme. Their made-from-scratch crust is thin and fluffy. The perfect base for piling on all five food groups for a taste of nutrition in every bite. Angelina’s has been tossing pizzas longer than anyone else in SoWal. The family restaurant in Seagrove Beach makes all their sauces and pizza dough in-house and from scratch using family recipes that have stood the test of time. The kitchen keeps it simple with fresh ingredients that make each pizza perfect. Satisfy your pizza cravings and create your own hand tossed pie loaded with all your favorite toppings. The New York-style pizzas are offered a la carte with a multitude of toppings on the menu and come in three different sizes – 12, 16, and 18 inches. Specialty toppings like roasted red peppers and gorgonzola cheese keep things interesting. Good food. Good people. Good times. Pizza Bar serves up wood fired Napoli pizzas using traditional cooking techniques, down to the mixing of the dough and handmade mozzarella. Good food is all in the details. Pizza Bar’s menu features more than a dozen different red and white pizza pie offerings. Each 11-inch wood fired pizza is made to order and topped with fresh local produce, along with imported meats and cheeses for the most authentic taste. Classic Margherita is topped with fresh basil and mozzarella, and the Farmer’s Market pizza is a great showcase for fresh, seasonal vegetables sourced from local farms and fields. Farm Fresh at Pizza Bar. Grab a seat on the terrace with incomparable views of the dunes and beach in Seaside or call ahead and use Pizza Bar’s walk-up window to avoid the wait. Get your pizza fix at Grimaldi’s at Grand Boulevard. 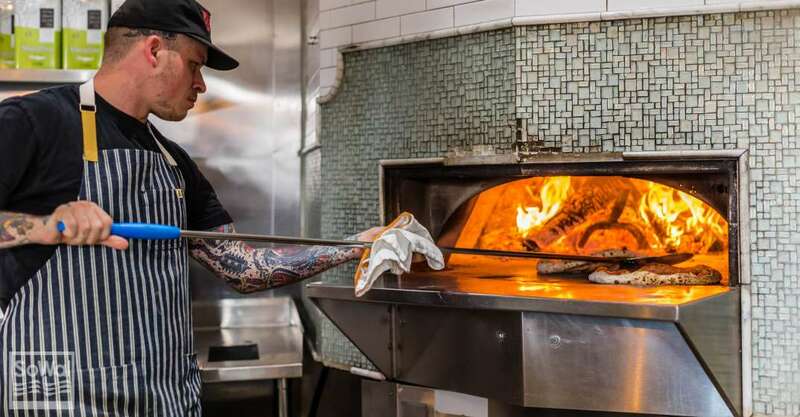 The coal-brick oven pizzeria has an open kitchen where you can watch the cooks throw dough and stoke the fire. Build your own pizza with traditional red sauce, white sauce, or pesto and almost thirty toppings to choose from. An extensive wine list, beer on draft, and outdoor seating make Grimaldi’s a fun place to bring the whole fam, fur babies included. Specialty pies like the Brooklyn Bridge pay homage to the restaurant chain’s humble beginnings – back when it was a single family owned restaurant. It comes with Oven Roasted Red Peppers, Creamy Ricotta Cheese, and Hand Pinched Italian Sausage. We’re glad they branched out. Pizza by the Sea has four locations in SoWal. If you’re out doing some holiday shopping at the The Market Shops or Gulf Place, definitely stop by for the best lunch special in town! For $8.99 you get to pick two. Choices range from a GIANT slice (1/4 of a large pizza!) to salads, baked spaghetti, or a bowl of soup. The lunch special is good during weekdays from 11-3 and includes a fountain drink. Pizza by the Sea also has gluten free crust and dairy free cheese…take that allergies! Pleasant courtyard dining at Pizza by the Sea at The Market Shops. That’s thanks to two Italian imports, Chef Alfonso himself and the wood fired oven he had shipped from home…the only one of its kind on the Emerald Coast. Happy Hour at Pazzo features $10 bites, including pizza up to three toppings, and buy one get one drinks. Order the Regina Margherita and thank us later. It’s topped with San Marzano tomato sauce, fresh mozzarella, and basil, then drizzled with extra virgin olive oil for authentic flavor. Consistently voted Best on the Emerald Coast, Fat Clemenza’s house made wood fired pizza is a local legend. All pizzas made from homemade dough, homemade pizza sauce, hand tossed by a master pizza chef from Italy and fired in a 900-degree wood burning oven. The extensive menu has combinations galore, like Capricciosa topped with domestic ham, spinach, hot salami, fire roasted peppers, caramelized onions, mushrooms, tomato sauce, and mozzarella. Mouthwatering. Bruno’s is a classic pizzeria with an open kitchen that allows you to watch your hand tossed pie being made from start to finish. Their fresh ingredients and creative combos will have you howling at the moon. There’s a specialty pizza named for each of the sixteen different neighborhoods along Scenic 30A. The mother of all pizzas will cost you a cool Benjamin. The 30A Pizza has every topping in the house – 23 lbs. worth – loaded in an 18×26 pan. For something a less massive and equally delicious, stop in for lunch and enjoy the all you can eat pizza and pasta bar for just under ten bucks. Amici 30A serves up artisanal wood fired pies in their rustic-chic restaurant at 30Avenue. The family friendly restaurant encourages spending time with those you love over sharable plates and signature Neapolitan pizzas. The Farmers Market pizza comes with San Marzano tomato sauce, mozzarella, roasted peppers, grilled zucchini, wild mushrooms and basil, topped with fresh baby arugula. Gluten free crust is available, as well. Epic pies at Southside Slice. Pizza lovers in SoWal have so many options to choose from that even a pesky gluten allergy can stop this train! Whether you’re craving wood fired or New York style, plain cheese or piled high with toppings, there’s a pizza in SoWal you’re bound to love. Your mission awaits. Godspeed.